Also Known As: "Yonika", "Cham", "Ham", "Hebrew: חָם", "Modern H̱am", "Tiberian Ḥām; Greek Χαμ", "Kham; Arabic: حام", "Ḥām"
Son of Noah . and Naamah . Brother of Japheth . and Shem . Genesis 10:6-20 List of his descendants who are associated with the general region of Africa and Babel. The Bible refers to Egypt as "the land of Ham". Genesis 9:20–25 relates how Ham discover his father Noah, lying drunk and naked in his tent, and is cursed for this. The Talmudic interpretation of this is that Ham castrated his father to ensure that no more sons would be born, which would reduce Ham's portion of the world. See also (don't merge): Khem Zarathustra. There are MANY different sources that give the name and lineage of Ham's wife. All sources agree that he only had a ONE wife. The question is who this was. As such, this tree tries to accommodate all sources entered. See Wives aboard Noah's Ark. Ham could have covered his father rather than exposing him to his brothers. He did not respect and honor Noah. Noah cursed Canaan, Ham's son, but didn't curse Ham. Perhaps Canaan may have had a part in the disrespect of Noah. The curse indicated that their descendants would be oppressed and under control of other nations. HAM'S descendants settled in Southern Arabia, Southern Egypt, East shore of the Mediterranean, and the North coast of Africa. The territory in which Ham's son Canaan and his descendants settled became known as Canaan, which later became the home of the Israelites with Joshua as their leader. 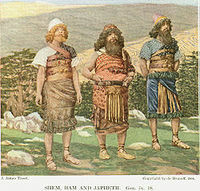 Noah's sons (Ham), who was secretly a disbeliever but had pretended faith in front of Noah. The sons of Noah are not expressly mentioned in the Qur'an, except for the fact that one of the sons was among the people who did not follow his own father, not among the believers and thus was washed away in the flood. Birth of Put Phut .